How Do I Cook That? How Do I Store That? While we lost a garden for the time being, in 2016 we grew and donated 666 pounds or organic vegetables. Grand total 7,004. Thanks to all our super volunteers! 2015 was another grand year in growing and giving. Year end count was 1,201 pounds. This total adds to the previous grand total and to date we have donated 6,338 pounds. Another big thank you to my Heaven and Earth Grower volunteers who worked the gardens at Elmhurst Presbyterian and the Garden on Church Street. This summer we donated 369 pounds of organic fresh vegetables to local food pantries. While the numbers were slightly down from last year, I am grateful for what we grew. This number add to the donations for the last 11 years, grand totaling to 7,839 pounds. Much work has been completed this fall on the Church Street garden on the property of the First United Methodist Church. We tilled each plot (10), added chopped leaves/grass and even dug compost into each plot. So I am assured of a wonderful bounty next summer. Thanks be to God and thanks to ALL the super volunteers. 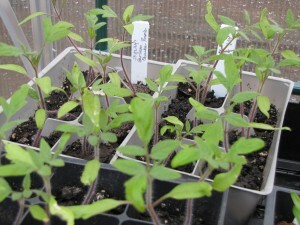 Spring is finally here and most gardeners are having hopes for a great growing season. Here at Heaven and Earth Growers were are planning garden clean up days, planting days and rounding up all the volunteers for the Growing to Give season. It’s very comforting to smell the clean air after a spring rain. Rain barrels have been attached to the downspouts, seedlings are now strong enough to come outside for a nice dose of photosynthesis. Anxious to do more than one can in a day, I must pace myself. This is the best time of the year for yours truly. 2013 was the first year for our garden at the Redeemer Lutheran Church. The garden is one of the largest with a harvest of 617 pounds! With the other two gardens the totals this year were 1,027. Grand total to date 3,919. The summer of 2014 was very successful! 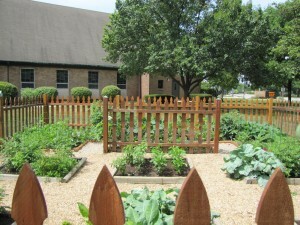 From the three gardens we have grown and donated 1,218 pounds of organic vegetables that went to local food pantries. To date, Heaven an earth growers have donated a total of 5,137 pounds of fresh organic vegetables to local food pantries since the summer of 2007. Thanks to all of the volunteers! It’s cold outside, but already I’m making moves about what I want to plant this summer. The year 2012 was a hard summer with extreme heat in July and the drought that hit the Midwest really hard. Farm crops suffered. Already I’ve seen a change in the current winter. Here, outside of Chicago, we still have not had a measurable snowfall in 320+ days. We’ve had some rain and sleet, but no snow. I can’t help but notice the killer heat down under in Australia right now: 122 degrees in the shade. Is this what we have in store for this coming 2013 summer? Heaven and Earth Growers did well with their harvest last year, but it took a lot of watering and dedicated volunteers to maintain the gardens. We learn a lot from our harvests: what did good and what we won’t plant next year. Keeping it simple is a bit hard for me because I like variety. 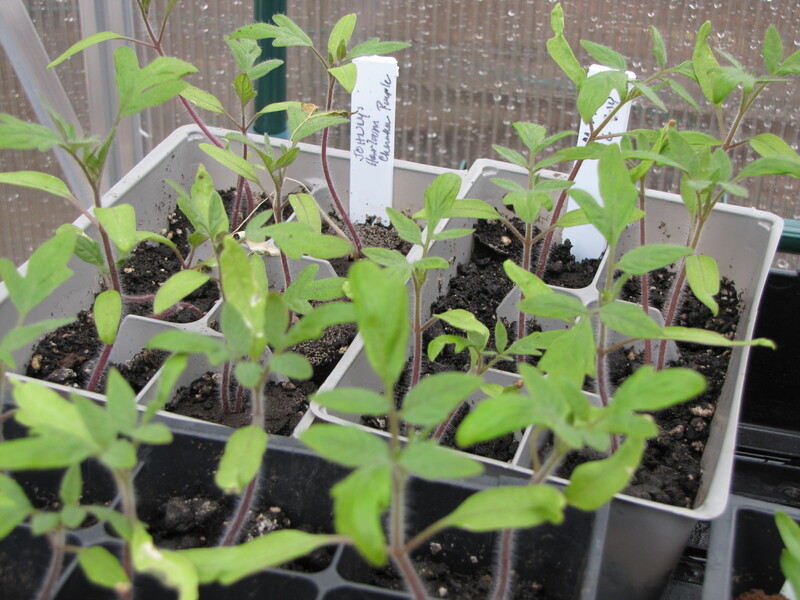 I end up planting tight rows – but a resolution this year to give my plants more space. The H&EG gardens can simplify, but I might try new varieties in my home garden. Thinking organic thoughts. In the spring of 2012, ECP members and friends of H&EG helped to add on another eight feet of garden space to the west. Our garden now measures 24’x24’. The garden was planted late due to the addition, and harvest was a bit lower than last year. Vegetables also took a hit from the very high summer heat and drought. However, special thanks go to Jeff Waters, Dave Fuesz, Craig Happel and Jim and James Gegeanis for helping with the garden addition. Also thanks to Tim Christopher for his help in the fall garden clean up. Our 2012 total produce donation update: 667 pounds planted, harvested and donated. This total donation is a combination of EPC’s Children’s Garden (164), H&EG individual donations (118), one garden plot at the Elmhurst Park District’s Golden Meadows (143), and the garden on Church Street (242)—south side of the Methodist Church. The Church Street garden was worked by Amy McConnell and family, gardeners from St. Peter’s UCC, youth group from Faith United Methodist, and H&EG. The EPC Children’s Garden held its own thanks to Jeff Waters, John & Dawn Helm, Dave & Pam Fuesz and, and all the little children of EPC. Our produce was mostly delivered to the Yorkfield Food Pantry, People’s Resource Center, Shared Senior Housing in South Elmhurst, Bensenville-Wood Dale Food Pantry and the pantry at IC. We have more young growers every year who are learning the craft of growing their own food. This was our sixth season of growing to give and we are always learning something new. Since the summer of 2007, Heaven and Earth Growers have donated a total of 2,892 pounds of fresh, organic vegetables to local food pantries. We are hoping to build another garden in 2013 at a new location in Elmhurst. We thank God that so many good growers participate in our cause by donating their extra produce to feed others. Thanks to all the growers…to them we are forever grateful. Many hearts combined make a rewarding experience for all. Thanks be to God. We Grow to Give! Heaven and Earth Growers have donated a total of 7,839 pounds of fresh, organic vegetables to local food pantries since we started growing in 2007. Every year we seem to be donating around 300-1,000 pounds (plus or minus depending on the weather, etc). Let's visualize just 500 pounds and stack about 100 five pound sacks of flour (or sugar) side by side. How many aisles in the grocer store would that take up? Growing is good, growing organically is better. We Grow to Give. Here are some of the food pantries where we take our produce, including location and times they are open. H&EG volunteers clean, weigh and wrap all produce donated and we keep a log so we know how we’re doing from month to month, year to year. If you have an organic garden with too many tomatoes or zucchini, we will accept and deliver your produce. Please see the “contact us” section of this website. Generally, we try to pick and deliver on the same day so the recipients are getting very fresh produce. WE GROW TO GIVE. Elmhurst Yorkfield Food Pantry, 1099 S. York Road, Elmhurst. (new building in back) Deliver Monday before 7 pm; Thurs before 1 pm and 6 pm; Sat before 9 am. Their new building has refrigeration! Immaculate Conception Church Food Pantry, 132 Arthur Street, Elmhurst. Mon-Fri 10-12am; Refrigeration. York Township Pantry, 1502 S. Meyers Rd, Lombard; drop off before lunch; no refrigeration.